Learning these words (along with basic English vocabulary) will help you to understand more of what you read with only occasional use of a dictionary. That’s essential for comprehension, so you don’t lose the thought you’ve just read while constantly looking up words you don’t know. Even the small number of academic vocabulary words on this list (100 word “families”, or over 200 words counting all the most common forms) can help you get closer to the level you need. That’s the main focus of this site, and this page in particular. There are of course many more words you will need to understand to do serious academic or professional work in English (and you can also practice many of the others on EnglishHints). However, this list of vocabulary words is an excellent place to start. It’s based not only on my own experience (as a student, reader, and teacher), but also on lists made by several other teachers and researchers. Note that many of these words have been used so much that they have developed more than one use or meaning. It’s important to notice how they are used, as you read, and not just memorize a simple definition. Vocabulary.com is very good for giving the different senses of words, as well as lots of examples of their use in sentences. See especially the 100 words on the Academic Vocabulary Toolkit list— somewhat different than this list (especially since she counts each form or part of speech separately) —but well worth the study. If you only have time for one sub-list of 10 words, try list 3 (see list intro-- "Read More"-- for links to the 10 sub-lists). You will already know many of these words. Learn the others with the help of the links on this page, and you’ll be well on your way to reading whatever you need to in English! Note: Each word family begins with the verb (vb. ), if it has one, followed by its noun (n.) or nouns, and common adjective(s) (adj.) or adverbs (adv. ), if any. Only commonly used forms are listed. Spellings are American, when British spellings differ (analyze vs. analyse, etc.) Both American and British spellings should be acceptable anywhere. You can practice most of these words in the Investigations Crossword. 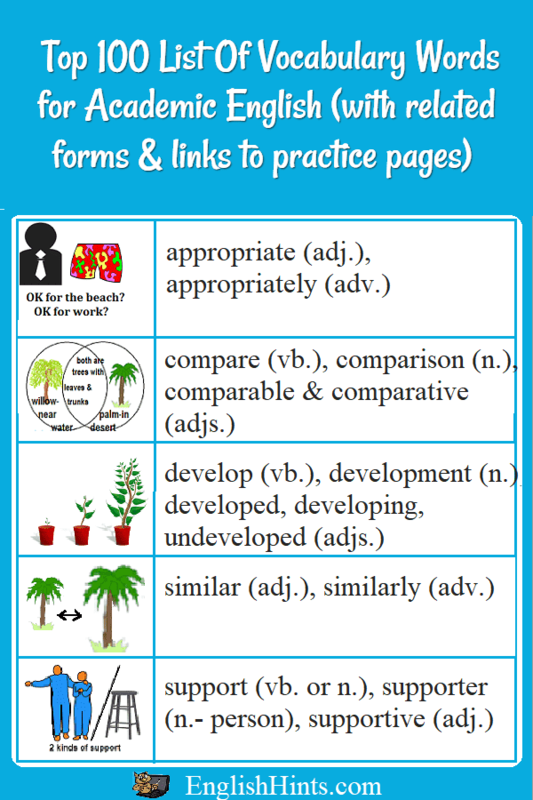 (answers here) and Scientific Method Vocabulary. If you already know most of the 100 words on this priority vocabulary list, the other words taught and mentioned in Scientific Method Vocabulary and the other pages linked from this page are also worth learning. *Often (though not always) if a word is used both as a noun and a verb, the noun form will have the accent (stress) on the first syllable and the verb on the second: con'-trast as a noun; con-trast' as a verb. However, 'support' in section 3 has the accent on the second syllable for both noun and verb forms: sup-port'. Ben'efit in section 3 has the stress on the first syllable for both. There's a word search puzzle to review these words (and the words in sections 3 & 5). Its answers are here. Many of these have noun forms (accuracy, awareness, precedent, relevance, significance, similarity, validation & validity, and some that are less common), and a few have verb forms (alternate, convince, maximize, minimize, precede, specify), but most are not as common as the adjective or adverb forms. Art Vocabulary explains and demonstrates a number of the words on this list & earlier ones: aspect, perspective, & symbol, as well as assumption, demonstration, explanation, illustrate, and illustration. Free Word Search Puzzles has a number of academic vocabulary word searches. There are links to to of them at the ends of section 1 and 2, but the first also includes section 3 and the second includes all the word families in section 4. It has two more puzzles at the end of the academic section with 50 words each-- 100 more very useful words for university study or professional work. Home> TOEFL & IELTS Vocabulary> Priority List of Vocabulary Words.